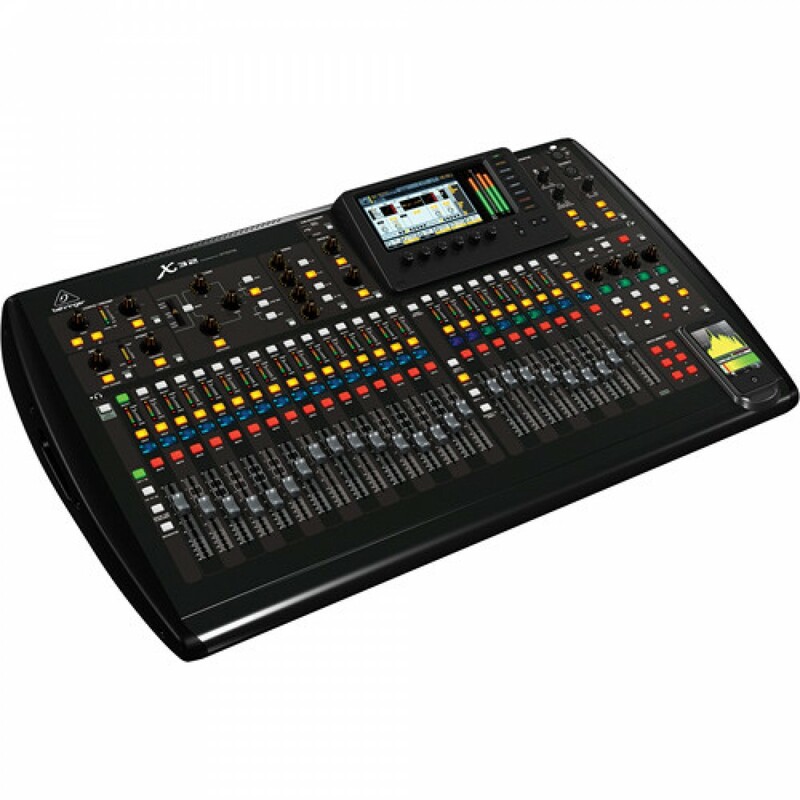 Rent a Behringer X32 Digital Mixer, our most versatile and full featured mixing board, and eliminate the need for bulky and expensive outboard effects and processing. The Behringer X32 40-Channel, 25-Bus Digital Mixing Console provides a wealth of features in a compact design, ideal for professional live and recording applications. The mixer features 32 fully programmable MIDAS-designed mic preamps. The Main LCR (left, center, right) channels, 16 mix busses, and 6 independent matrix mix busses all have 6-band parametric EQs and integrated dynamics processing for excellent sonic tailoring capabilities. The mixer has 16 analog XLR outputs, as well as 6 balanced line-level 1/4" Aux inputs and outputs and two 1/4" headphone jacks. The talkback section allows you to communicate with the integrated mic or an external mic. The mixer also has a pair of AES50 ports that feature KLARK TEKNIK SuperMAC networking capability for use with 48-channel digital snakes for ultra-low jitter and latency. The system also has an integrated expansion port that includes a 32 x 32 XUF FireWire/USB audio card. The built-in Virtual FX offers 8 true-stereo FX slots that deliver high-end simulations of popular processors, such as Lexicon 480L and PCM70, EMT250 and Quantec QRS, etc. The integrated high-power 40-bit floating-point DSP system delivers "unlimited" dynamic range, no internal overload, and near-zero latency between inputs and outputs for top-quality performance. The mixer also has 6 mute groups and 8 DCA groups on 8 dedicated faders for easy access. The intuitive interface offers tremendous ease-of-use with a dedicated channel strip section that has direct-access controls. There is also a high-resolution 7" color TFT display with associated controls and individual RGB backlit graphic LCDs on every channel. The unit has 25 motorized 100mm faders for extensive user-definable control. The system has a USB flash connector to provide file storage for uncompressed recordings, show presets, and system updates. There are also connections that support the P-16 personal monitoring system, AES/EBU stereo digital outputs, and MIDI. Adjustable line delays are available on all of the physical inputs and outputs. Other features of the X32 include networked remote control or show setups with the included remote editor software via USB and Ethernet ports. You can even conveniently handle the scene management duties of complex productions. All of these features are packed into a compact and durable enclosure to ensure a long life of professional use.